Its time for new Claudia and Company challenge!! We've a fun theme today.. I created this fun card...the card front is gift card holder...rest is like regular A2 size card , you can write your message inside. 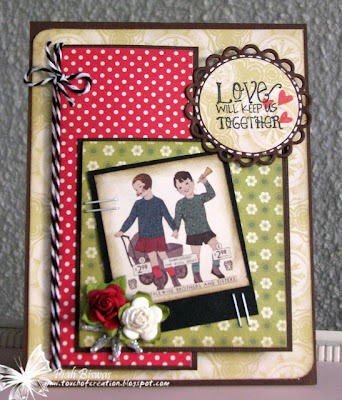 The lovely papers are from Cosmo Cricket~ Odds and Ends collection and the sentiment is from Verve Stamps. Hope you all are enjoying the weekend...long weekend for some of you! Lately I'm seeing this fab pattern all over the Blogland..thanks to Cath's Chevron Chic Challenge in the Moxie Fab World. 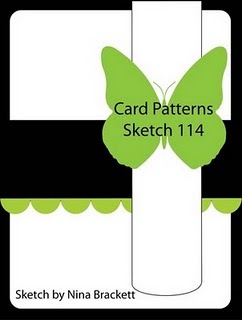 A fun, clean graphic pattern...love it! First one is with the cute BEE digi from Paper Smooches!! A sweet & simple card!! Did you see the pattern on the bee?? As always the glitter is not seen in pics...I need glitter photography classes ! The next one is for for CAS-ual Fridays challenge in a Moxie Fab way! I really love these Chevron stars...Fun!! The allstar sentiment is from Papertrey Ink. I know may be my cards are not winner ones but I really enjoyed playing with this pattern...thank you Cath for this fun Challenge!! I'm back again! Really Mr. blogger is troubling us a lot lately....it took soooooooo long to post this. Anyway! I'm glad everything is okay now! I picked out this lil' guy for my card today.. I paired up Cosmo Cricket~ Social Club papers and SSS109 sketch for this fun card. 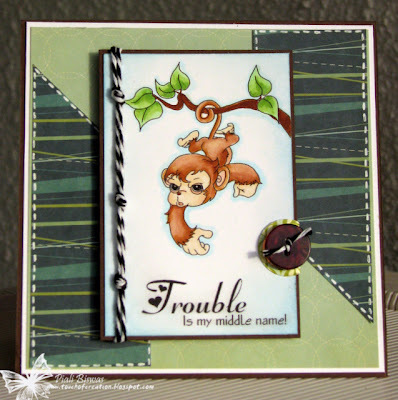 Partytime Tuesdays : Animal Themed Projects. Make sure to stop by the Aud Sentiment blog for all the deets...also check out the fabulous DT projects ..HERE! Did you all see the latest PINK CAT STUDIO Release????? 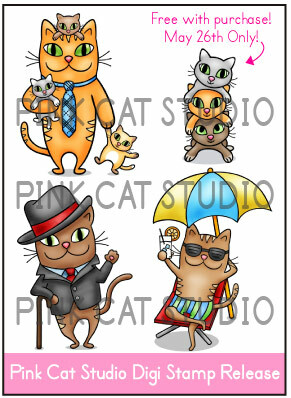 If you make a purhcase in the digi store today you will receive the "Kitten Pile " digi stamp for free! It will be emailed to you within 12 hours of your purchase. A Masculine birthday card.... for someone grown-up ... inside its say "you're one cool cat"
I used Basic Grey~ Life of the Party paper collection and PTI sentiments. Stamping Scrapping Central : Masculine. 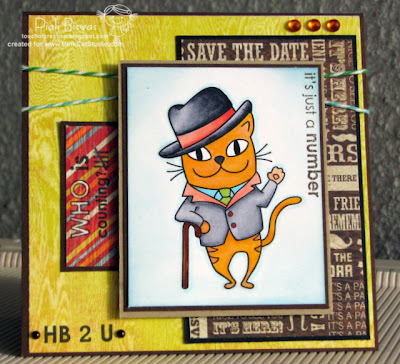 Now hop over to PCS BLOG to check awesome DT creations.... lots of ideas & inspirations!! I wanted to share a sweet card.....totally inspired my girls, you must be wondering how.....when they're together within a lil' while they start fighting like cats & dogs, again they can't live without each other....growing up with sisters is really fun!!! I always tell them what it says in the sentiment of this card.. 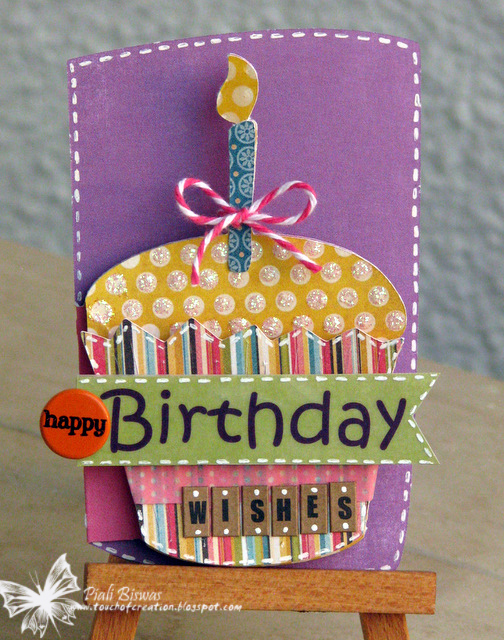 I sued the Girl's Paperie~ Jubilee papers for this card...love the fun colors and the patterns. The silhouette cut is from A Child's Year cricut cartridge. The sentiment is computer generated.... for the word Sisiter I used Tim Holtz's Vintage Market die...love that font! Hope you like my card... make sure to check out Claudia & Company blog for gorgeous DT inspirations!! Tomorrow is Jessica's Birthday!!! 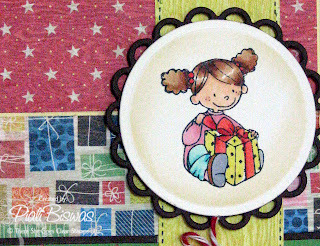 We're celebrating her birthday with a SURPRISE blog hop. I'm so glad I met Jessica and had an opportunity to work with her in THERE SHE GOES STAMPS DT. She is an amazing person and Awesome Crafter!! Love you Jessica....hope your B'day is a blast!!! hop over to Angela's blog to start from the beginning and find out the entire list of participants for today's hop. 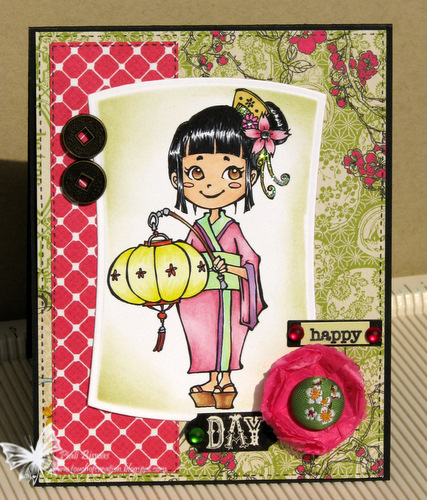 I loooooove all the TSG stamp set so I mixed a few of them for this card..
Can you guess all the TSG stamp sets I used ??? We all love you JESSICA....thank you for the fabulous There She Goes Stamps!!!!! Yep!! You see something unusual, isn't it??? No stamping is okay but today its totally different..I used my Cricut after ages!! This card is made with cut from Wild Card cartridge. The fun papers are from My Mind's Eye~ Stella & Rose collection. 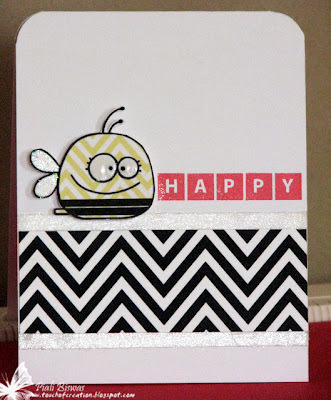 I used Echo Park double sided cardstock...its perfect for this kind of project! The sentiment is most fun part..its a mix of brad, K & Co. sticker and Jillibean Soup Kraft mini alphas. 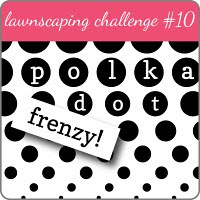 Lawnscaping Challenge : Polka dots. Wee memories : Use Sticker, rub ons etc. Catch The Bug: Polka Dots & Stripes. Make sure to stop by Claudia and Company blog for check out the lovely DT samples!! Our sponsor for this challenge is Digi Chick. What a fun company! You should pop over there and take a look. We-- DT gals were asked to pick our own Digi stuff from the fab Digi Chick store...WOW!! there was a lot to choose form..I almost wanted 50% of the store..lol!!! 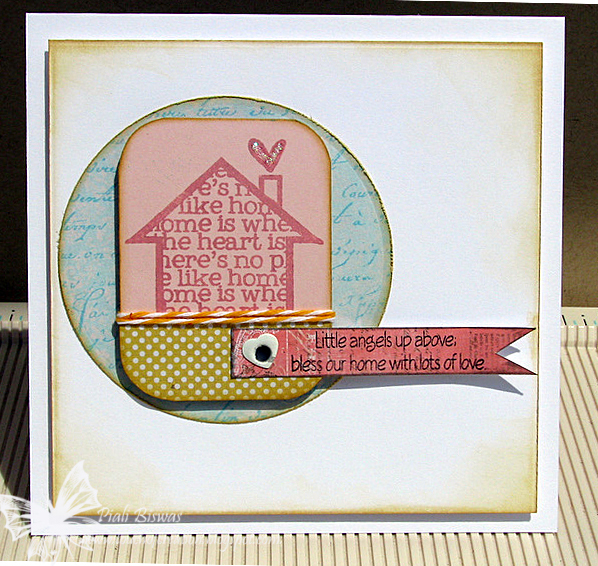 I usually work with digi stamps/images but today I used few elements from a Designer Kit by Mari Koegelenberg ~ In the Birdhouse . 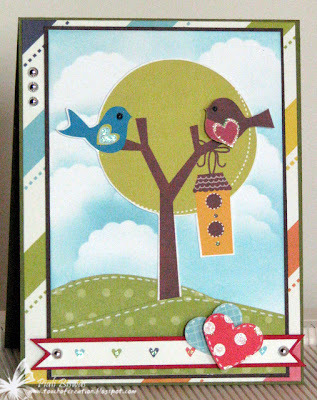 I paired up the lovely brd and birdhouse images with Echo Park~ Playground papers for this card. Just added the a little diamond stickles for a lil' sparkle! 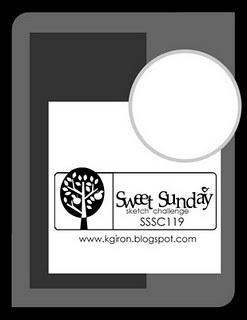 A sweet & simple card ...just in few minutes , no stamping, no coloring yet very cute!! I thinking I'm going to use digi kit more in future. I created the sky background just by sponging Distress ink around a scalloped circle die cut. Also added a few silver pearls from Pizzazz Aplenty to finish . Creations by Gill M: Birds in the garden. 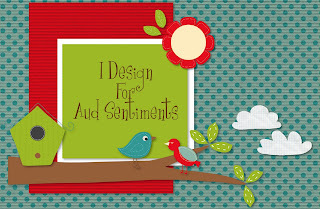 So hop over to Aud Sentiment blog to check out the gorgeous DT creations!! 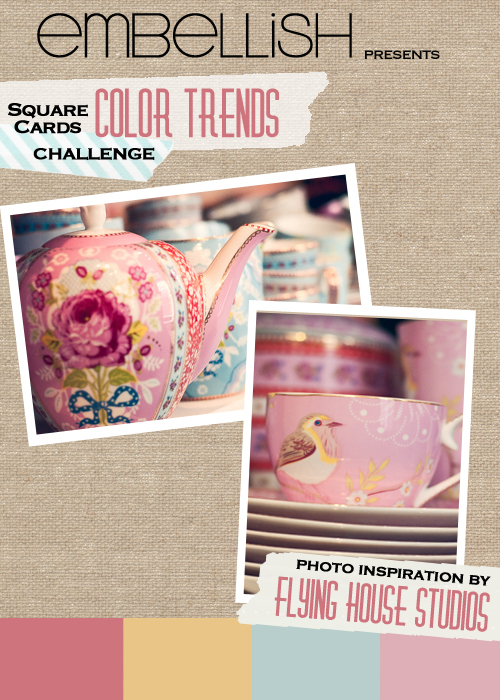 Hope you'll join me for this challenge...click HERE for all the deets! Welcome to Day 2 of Mother of All Blog Hops 2011 edition!!! Hope you all enjoyed yesterdays fabulous hop!! I love the sweet image...its lot like my little one opening her gifts. 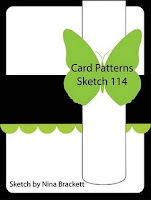 The sketch is from this week's Card Patterns. -One blog hop participant will win $100 to spend in the There She Goes store plus the chance to work with me on designing a stamp set of their choice. 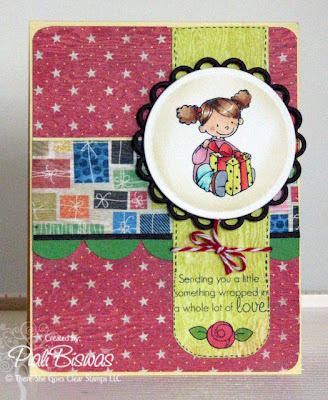 - One blog hop reader will win free stamps for six months! A value of over $300! (winner will receive all new stamp sets released from June to November 2011. -Readers must comment on all the blogs in the MOABH to qualify for the prize. After you have completed the hop, please put your name and blog address or e-mail in the INLINKZ at the bottom of MOABH post. You are not "required" to comment on all blogs, but in doing so you will increase your chances of winning! 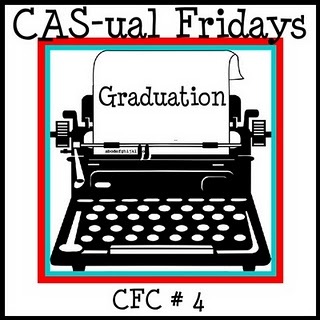 Next stop is..... EMMA's blog. 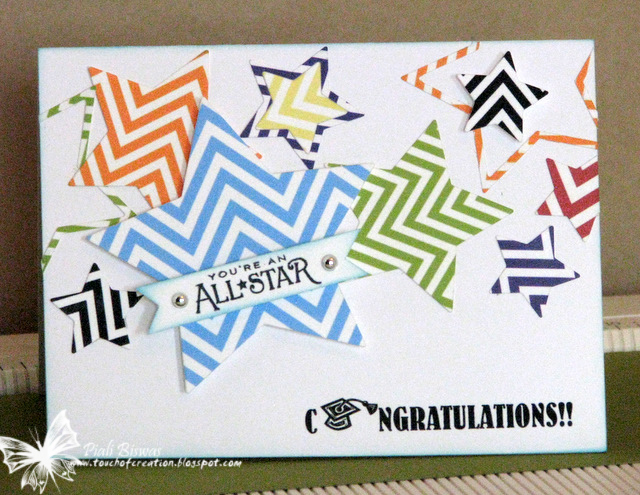 This card is designed with few challenge themes... like colors & shape from Embellish, Text- CAS-ual Fridays#1 and the sketch is from this week's CPS challenge! I like to use text background or images...I almost have text on each layers! The House stamp is from Unity stamp and the sentiment is one of my fave There She Goes stamp. 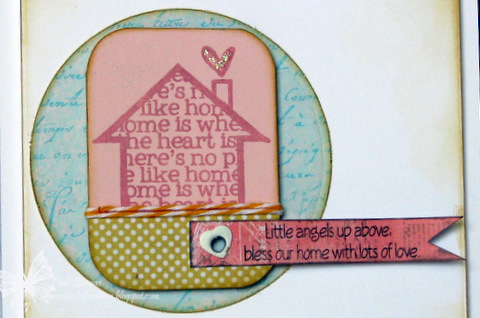 Anything Goes Challenge: Home Sweet Home. I'm back with a sweet card... love this image from Sparkle Creations Rubber stamps.... She is Rin!! I used some gorgeous Webster's Pages papers...worked perfectly with this image. The sentiment is stickers from Echo Park~ For The Record collection. Just made a flower with some recycled tissue paper and a lovely brad. Added some frosted pearls and white rhinestone from Pizzazz Aplenty to finish my card. Sparkles Forum : Anything Goes!. By the Cute & Girly : Anything Goes. 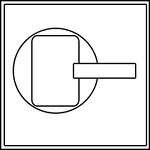 Use It Tuesdays : Fasteners - buttons, brads, eyelets etc . Brads are very old and the papers & stamp is new. 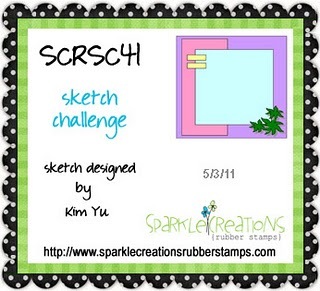 Creative Craft Challenges : recycled. Just Add Ink:: Just add a flower. Congrats Yvonne!! Please email your digi choice at piali[dot]biswas[at]yahoo[dot]com. 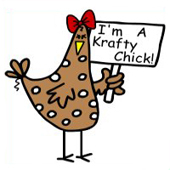 I'm a Krafty Chick now.... 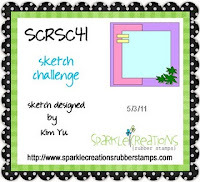 I made the top 5 list of "That's Krafty Thursday#50"
I was also Fabulous Four for the last SCRAPPY SATURDAY CHALLENGE.. I saved the best for the last.. If you didn't know about this fun challenge blog....please check it out HERE.